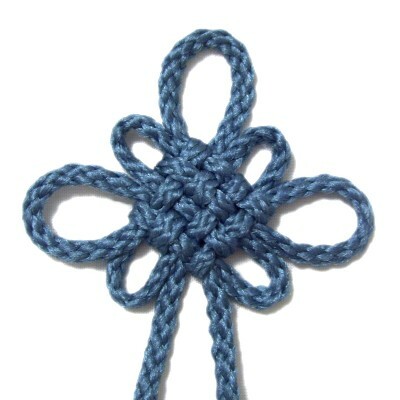 Description: The Mystic Knot is also known as the Pan Chang Knot. It represents the endless cycle of nature. There is a closely woven diamond design in the center. Surrounding it are three loops and four folded segments. 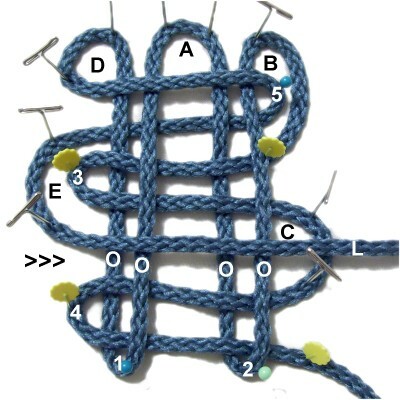 This traditional knot is one of the most highly used techniques in Chinese Macrame. It is also the most complex. Practice it several times, until you can make it without the instructions. I recommend you use material that is flexible, which makes tightening easier. Size 2mm or 4mm will give you more room to work. Make the knot at least 4 inches in length the first time you practice it. 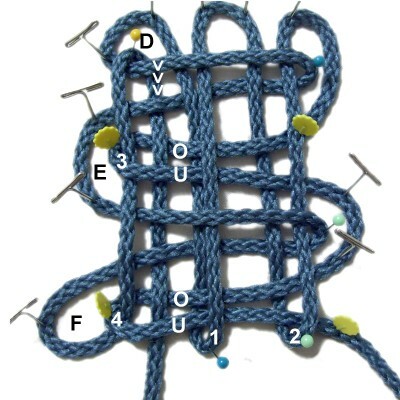 You can use this knot in a variety of Macrame projects. Try it as a pendant, a focal knot for a bracelet or belt, or even a clasp for a purse. 2018 Update: Both images and text were changed, so contact me if you need the original page. Narrow Bights -- Labeled with numbers and small pins. 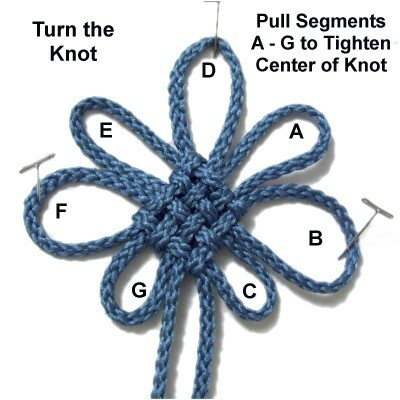 These form the woven portion at the center of the knot. Loops and wide folded segments -- Labeled with letters and large pins. These are outside the center area. Step 1: You need one cord at least 90 inches long to make the Mystic Knot. I recommend you make it 4 inches long the first time, so you have room to work. Reduce the size and use a 72-inch cord after you have practiced a few times. Step 1: Secure the center of the cord to your board on your left. Move the right half of the cord forward 4 inches, fold it to form a bight, then bring it backward. Fold it again, then repeat. Step 1, continued: Mentally label the bights 1 and 2. 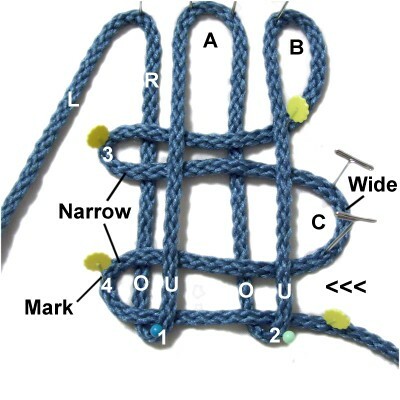 Adjust the width so they are both narrow, since they form part of the diamond shape in the center of the Mystic Knot. Between them is a wide folded segment. It should be at least 1-inch wide. Mentally label it segment A. Step 2: Move the right half of the cord clockwise to form a loop. Then fold it to make bight 3. Pass the new bight under - over bight 2, heading left horizontally. Then do the same through bight 1. Secure it with a different type of pin, or mark it in some way. 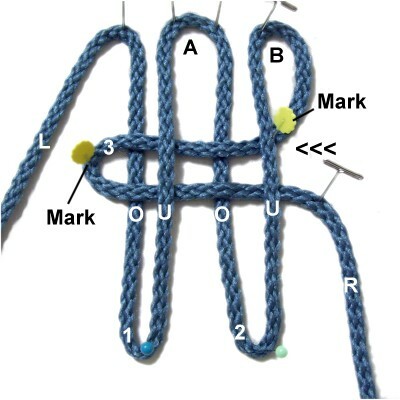 Step 2, continued: Mentally label the loop segment B. The bight should rest at the half way point between segment A and the folded area of bights 1 and 2. 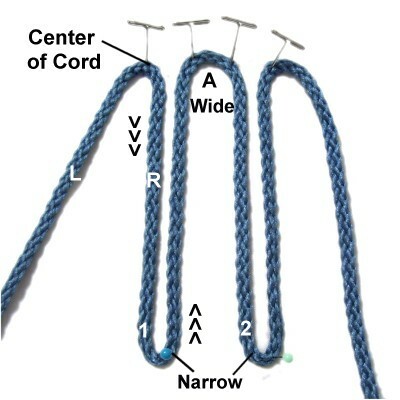 Fold the right half of the cord to make bight 4. Pass it through bights 2 and 1 under - over, heading left horizontally. Arrange it close to the fold of bights 1 and 2. Secure and mark it as you did for bight 3. Step 2, continued: This will create another wide area on the right, which should be labeled segment C.
You will no longer use the right half of the cord. Secure it next to bight 2, and mark it like bights 3 and 4. 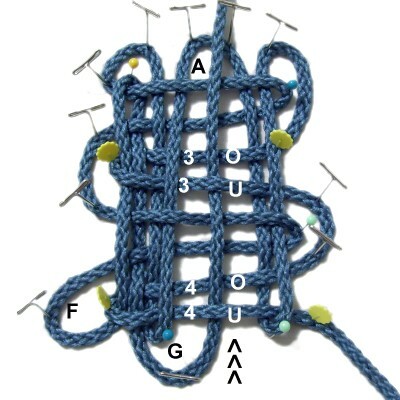 The purpose for marking these segments is so you can identify them easily when you do the weaving in step 5. Step 3: Make a counter-clockwise loop with the left half of the cord, mentally labeling it segment D.
Pass it over everything as you move it horizontally toward segment B. Fold the left half of the cord, then move it under everything as you bring it back to the left. Mentally label it bight 5. Make sure bights 2 and 3 are narrow, so there is space between them for the next step. Step 4: Move the left half around bight 3, and mentally label it segment E.
Pass it over everything as you bring it horizontally toward segment C .
Make sure this takes place between bights 3 and 4. Fold the left half of the cord to make bight 6, then pass it under everything as you move it back to the left. 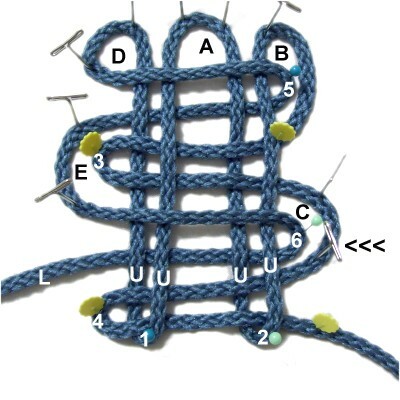 Before completing the Mystic Knot, you must first make some room for the weaving. Make bights 1 and 2 as narrow as possible, so the areas to the right and left of bight 1 are wider. Make sure you can easily recognize bights 3 and 4, which you marked for that purpose. 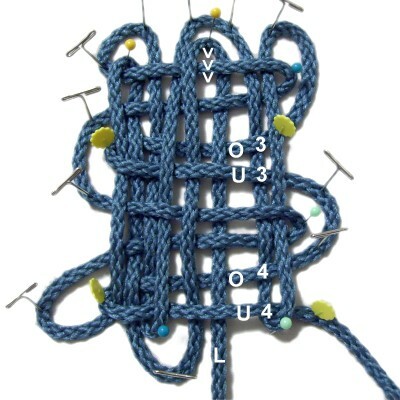 Designer's Tip: It's important that you understand the concept with the weaving you will do next. For that reason, I labeled the under - over sequence for bights 3 and 4 only, so they are more obvious in the following images. You pass the cord either over or under all the remaining segments, depending on which direction you are moving. Step 5: Rotate the left half counter-clockwise to form segment F.
Heading backward vertically, pass it over all the segments except for the marked bights (3 and 4), which are under - over. Designer's Tip: You can count the segments starting from bight 4 all the way to segment D.
You pass under the 1st and 5th segments and over the remainder. Now you reverse direction, moving forward through the knot. Pass the left half under all the segments except the marked bights (3 and 4), which are over - under. 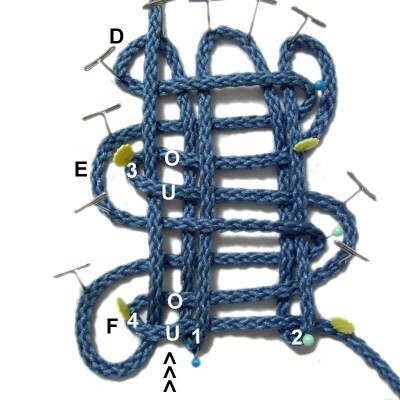 Designer's Tip: Counting from segment D forward to bight 4, you pass the cord over the 3rd and 7th segments and under the remainder. Make some room by moving bights 1 and 2 to the right and left, so you widen segment A. The next row of vertical weaving for the Mystic Knot takes place in that area. 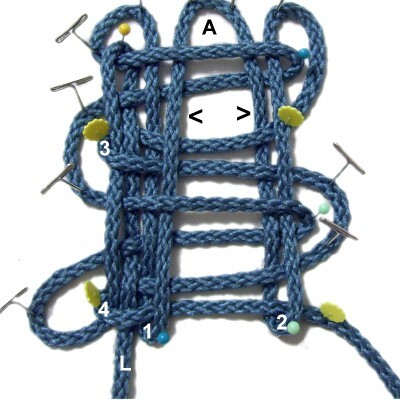 Step 6: Move the left half around bight 1, forming segment G.
Weave it toward segment A heading backward vertically, passing it over all the segments except bights 3 and 4. You move it under - over those two bights. 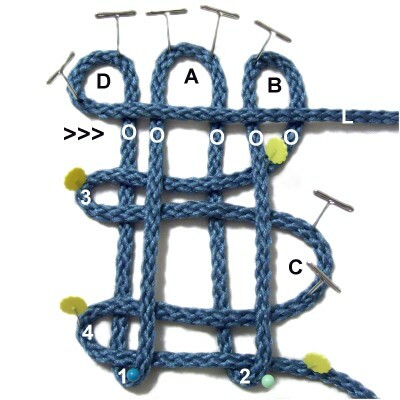 Designer's Tip: The weaving for step 6 is the same as step 5. The only difference is the location, which is through the area you widened. Move the left half forward through the knot, passing it under all the segments except bights 3 and 4. You move it over - under those two bights. 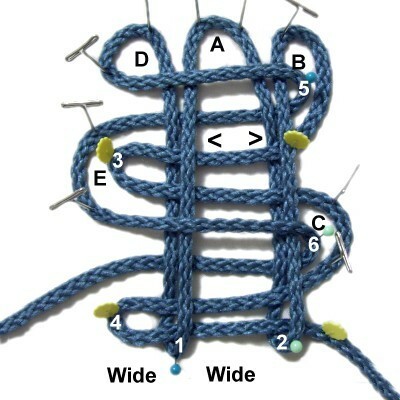 Step 7: Remove the pins from all the bights, which form the center of the Mystic Knot. Leave pins on segments A - G.
Remove some of the slack starting at segment D and moving both directions. Make sure nothing is twisted. 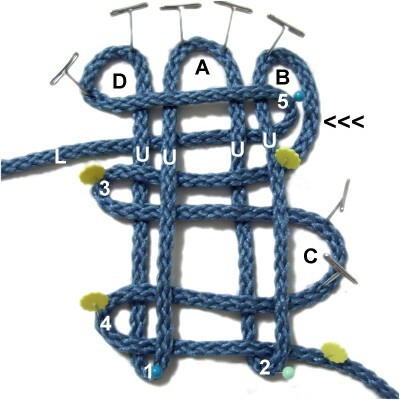 Turn the knot so the two ends of the cord are vertical, and the loops are arranged as shown. Pull each segment to tighten the center most of the way. 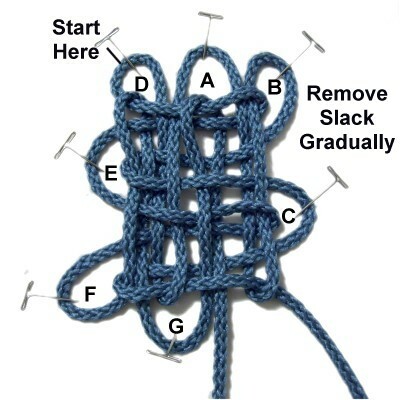 Remove slack from each loop gradually. Keep working until you like the shape, then tighten the center completely. The traditional shape for the Mystic Knot is for segments D, F, and B to be larger than the other segments. You can make all the loops the same size if you want a flower. Have any comments about the Mystic Knot? Contact Me.